When the sun disappears for days at a time, we find ourselves searching for brightness everywhere—anywhere—else. This month we’ve been busy working on our first collection of fine art under the Upper Notch Studio umbrella. Despite the weather, the world is offering up plenty in terms of inspiration. Here’s what we’ve been getting into. TAKING COMFORT amid the political turmoil in the beautiful lyrics of “Finlandia (This Is My Song).” Listen to this recording by the Indigo Girls and feel peace and renewed promise wash over you. 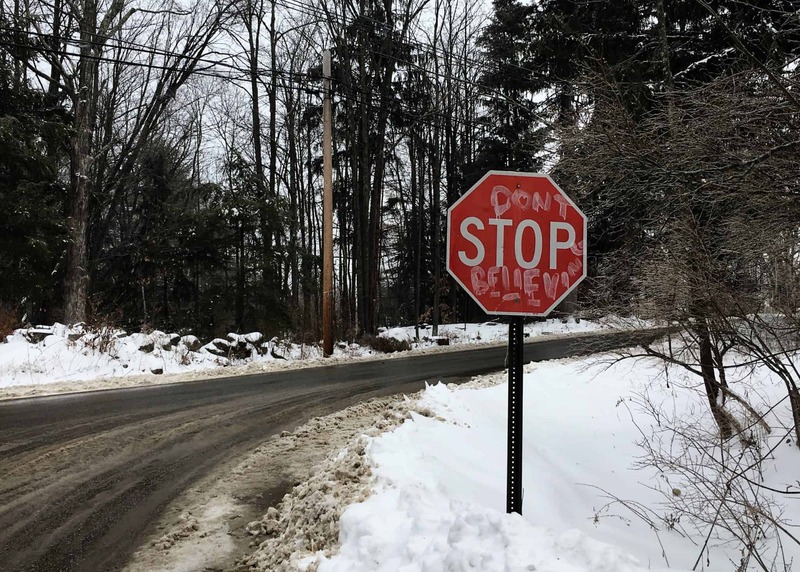 POWERING THROUGH frigid winter runs buoyed by the, ahem, creative graffiti of one budding young Deerfield artist, who has turned local stop signs into motivational totem poles. Who wouldn’t prefer to see “Don’t STOP Believin'” and “Please Don’t STOP the Music” on those red markers when you’re struggling to keep your energy high? Breaking-the-law issues aside, it’s a powerful reminder of how transformative art can be, even when it’s merely adding a new perspective to everyday objects or classic pieces. DISCOVERING a gem of a children’s book in The Storm Whale, by Benji Davies. If you have little people in your life, try out his inspiring tale and touching original artwork that follows a lonely young boy, Noi, as he attempts to rescue a beached baby whale by keeping him wet in his bathtub. This also includes: Feeling ever grateful for local libraries!